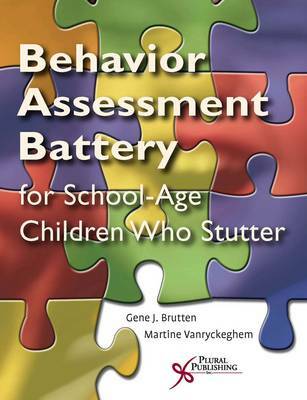 The Behavior Assessment Battery SSC-SD-Speech Situation Checklist Reorder Set includes 25 copies of the SSC-SD, one of the test procedures included in the Behavioral Assessment Battery. The Behavior Assessment Battery (BAB) is a multi-dimensional set of inter-related, evidence-based, self-report tests that provide normative data for children between the ages of six and fifteen. The Battery has evolved and been refined over many years and has been used with an innumerable number of clients all over the world.The test procedures include: The Speech Situation Checklists (SSC-ER and SSC-SD) - for evaluating a child's emotional reaction to, and speech disruption in a range of speech situations The Behavior Checklist (BCL) - reveals the particular coping responses that a child uses to deal with dysfluency The Communication Attitude Test (CAT) - for measuring a child's attitude about his or her speech These self-report test procedures provide speech pathologists and their professional colleagues - including teachers, psycho- and neurolinguists, clinical and educational psychologists, behavior therapists, and pediatricians - with a multi-dimensional view of how a child is affected by how he or she feels, reacts to, and thinks about his or her speech. Through the eyes of the child whose fluency is problematic, the BAB test procedures provide a picture of the speech-related aspects of the child's world that only the child can validly supply. By evaluating a child's overall score on the SSC-ER, SSC-SD, BCL and CAT and his or her reaction to the particular items that make up these test procedures, clinicians can determine the most successful treatment strategies and tactics.This battery serves to shape therapy and it provides the therapist with clear-cut indications of a child's speech-associated strengths and weaknesses and his or her particular needs.